As primary structural components of phospholipids, fatty acids are major building blocks of cell membranes. The ω3 long-chain polyunsaturated fatty acid, docosahexaenoic acid (DHA; 22:6ω3) is one of the most unsaturated fatty acids in the human body and is highly enriched in membrane lipids of rod photoreceptors (1). 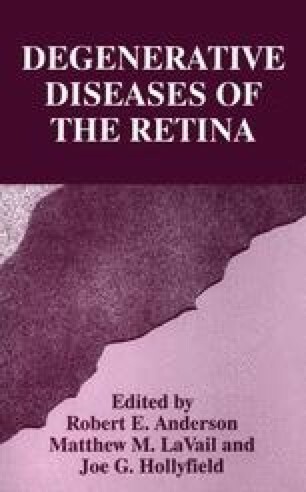 Several lines of evidence suggest that the accumulation of DHA in retinal membranes is important for normal retinal function. Abnormal electroretinographic (ERG) responses to light stimuli have been reported in DHA deficient animal models and human infants (2–6). Rat and monkey models made ω3 fatty acid deficient by feeding modifications express abnormalities in a- and b-wave ERGs (2–4). We found delayed maturation of rod ERG responses associated with reduced blood lipid levels of DHA in pre-term infants that received a commercial corn-oil-based formula compared to infants fed breast milk or experimentally-enriched DHA-containing formula (5,6). Although the physiological consequences of DHA deficiency are functionally demonstrable, the interaction of membrane-bound DHA with proteins and enzymes of the phototransduction cascade is likely to be a complex function of biochemical and biophysical parameters unique to the highly unsaturated hydrocarbon chain of DHA.